This is the 3rd part of a look at an interesting stove insert which has been designed to fit directly into a fireplace opening without too many modifications to the fireplace or surround. 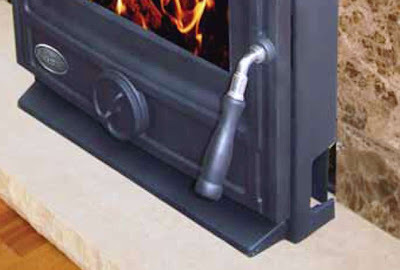 The insert stove gathers heat from the sides and back of the firebox by way of air channels. Cold air is taken in through two vents at the bottom of the frame, one either side, close to the ground. The air is heated in the space between the outer casing and the firebox, and the hot air escapes out through a slotted vent at the top edge of the frame. The air moves only by way of convection, no fan assist, through quite narrow airways. 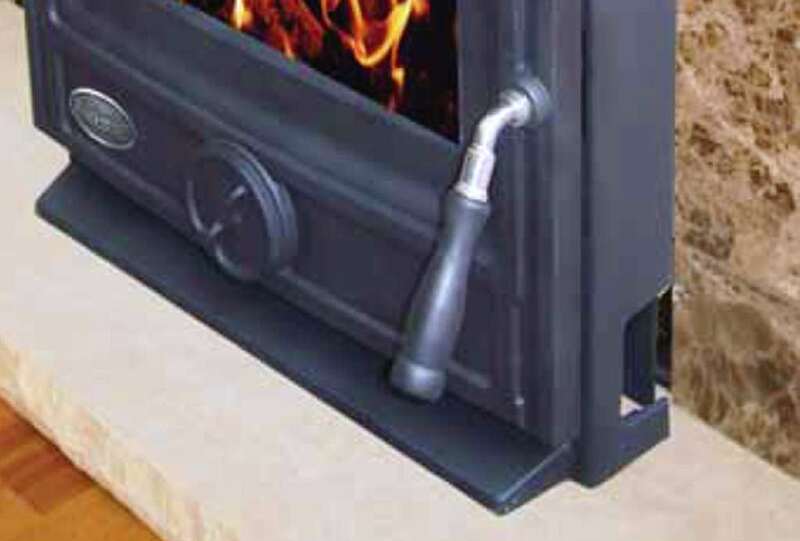 The air heated in and around the firebox is vented through the slots at the top of the casing. The silvery knob operates a damper. The function and use of the damper is not properly explained in the somewhat inadequate user instruction manual. The damper knob pulls in or out about an inch or so. There is, however, no clear indication in the instructions as to which is OPEN and which is CLOSED. For an item costing the best part of a grand, the instructions looks more like it came with goods bought in a pound shop. Blacksmith could really do a lot better here. The efficiency of an insert stove of this type is in no way comparable to a regular stove. My guess is that this stove is perhaps 20%- 30% less efficient than a free standing stove with air circulating freely all around it. That said, it is an elegant solution to, fairly effortlessly, making an open fire 200% more efficient, and, at the same time, making it safer, cleaner, and longer burning. At the list price of €870 is is quite expensive as stoves go. Its stated output is 5Kw and 72% efficiency. The Anvil stove, by way of comparison, sells at €450 has a stated output of 6Kw and efficiency of 80%. The Anvil has a stated 20% higher output - and a stated 11% higher efficient, although I would think the difference is perhaps greater than this. Next post on this subject - I will round up with some more details and a bit of feedback from the actual use of the stove. I have received a copy of the certification certificate of the Artisan stove along with a set of technical drawings showing an exploded view of the stove from Blacksmith. It all looks 100% kosher. As far as I can tell from the drawings, all the bits are in the right places. I acknowledge that I have only closely observed one installation and that any inefficiencies may well be associated only with this one stove and installation. The bottom line however, as far as this one installation goes, is that the output of this stove is substantially less than a similar size of stove, the Blacksmith "Anvil", which I have no hesitation in recommending. I would however put the output of heat from the inset "Artisan" as somewhat disappointing.